Modern soaker hoses eliminate the need to drag heavy hoses to water the plants and top soil - they are an efficient and convenient solution to grow healthy plants and enjoy the fruits of your labor without investing too much effort or money. Modern soaking hoses have evolved and are now lighter, more durable and efficient while at the same time less expensive. For this reason, an increasing number of households use soaker hoses to water the florae and soil in their gardens and fields. In short, for those who are not familiar with the term, a soaker hose is a porous garden hose typically manufactured from recycled tires. It is designed to be connected near the base of the plants you wish to water. The water soaks slowly out while flowing through the hose, and, in this way, you have a full control over the amount of water used. There will be no pooling around the plants, and you will complete the task almost effortlessly and quite quickly, especially in comparison to hand-watering. For all these reasons listed, we invite you to read the following guide that will inform you of everything there is to know about soaking hoses. We guarantee valuable information that will help you choose the best soaker hose on the market. Why buy a soaker hose? As water is flowing underneath the plants, they remain dry and are thus less prone to diseases. Hand watering is infamous for tending to create pools of water around plants that cause rooting and damage to the roots. The sprinklers make the leaves wet and allow for bacteria and decay to develop and damage or destroy the plant. As your plants will receive the optimal amount of water and be healthier, they are certainly going to be more visually appealing and livelier too. As you water only your plants, no weeds will be able to thrive around them and interfere with their growth. Using a soaker hose means that you no longer have to drag the hand hose and hold it during the entire process of watering your garden, which can take quite a lot of time depending on the size of your garden or field. 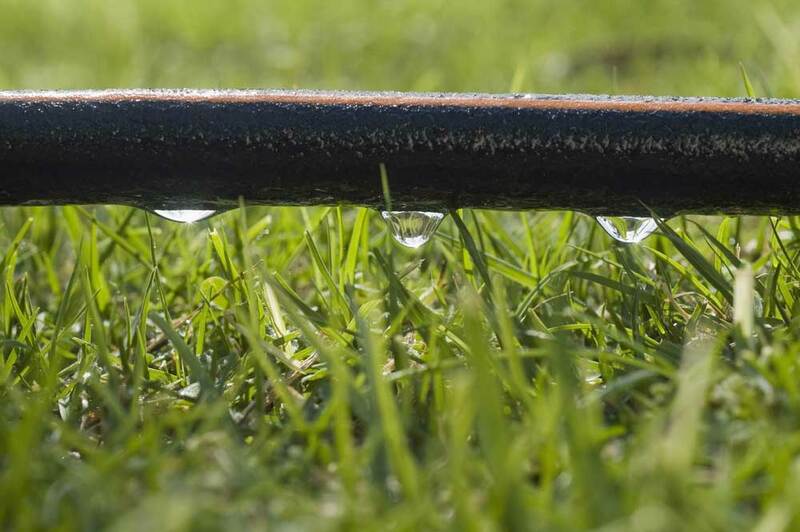 If you use sprinklers, you have to move them around, and a lot of water still ends up wasted on space that needn't have been watered in the first place- the use of soaker hoses eliminates such problems. After the initial installation, which is quite simple too, you will no longer waste your precious time on watering. Time saved can be dedicated to other important tasks around your property and home. As we have already suggested, the sole fact that soaker hoses eliminate the need for tiresome hand watering makes them extremely convenient and efficient. Being able to water the entire rows, or even the entire garden or field at once will save an enormous amount of effort and time. The control is easy, but an option to install a water timer which can switch the hose off and on again when required further promotes the overall efficiency and convenience of such gardening. The soaker hoses are easy to install and require lesser time and materials. After positioning the hoses in between plants, you simply attach the hose to an outdoor faucet. It is recommended to use the soaker hoses for watering around trees, the vegetable gardens, and flower beds. Unlike expensive drip irrigation systems, you will not have to buy or install additional equipment such as filters, emitters, or regulators. As made from recycled tires, the soaker hoses are both durable and flexible. They require almost no maintenance especially if you have the hoses installed under mulch and away from the sunlight. Soaker hoses can last for several seasons when used properly. Soaker hoses wet the plants and soil slowly and evenly, minimizing water waste and eliminating overwatering. As less water is used, the cost of watering reduces. As already mentioned, the soaker hoses use less water than other watering methods and prevent its overuse. They are also recycled products, what more could a planet lover wish for? What to consider when buying a soaker hose? We recommend flat soaker hoses to all those who are conserved with the visual appearance and appeal of their garden as they do not bulge as much as the regular circular hoses when installed. If you do not care much about aesthetics, opt for a round soaker hose as this type has proven to be a more durable and long-lasting solution. Round soaker hoses are also the heavier duty and able to withstand higher water pressure. Make sure that the hose is long enough to cover the entire area that needs to be watered taking into account all the twists or turns you will have to make so that no part of of your garden is missed. Soaking hoses are typically made from recycled tires but there are also ones made from fabric. We, however, recommend sticking to recycled tire soaker hoses as they are indisputably more durable and can last for several seasons. Make sure that the hose you buy can withstand both high and low water pressure. It must be able to withstand at least 20-30 psi. If the hose cannot handle the pressure, it may burst and flood the soil. The information regarding the pressure rating can usually be found on the packaging, or you can alternatively test its resilience against pressure by using a gauge. How to set up a soaker hose? When setting up the soaker hose, besides the actual hose, you will need to secure an appropriate water supply and landscape pins. Mulch is optional but highly recommended. First of all, you should lay the soaker hose on the soil and position it in a straight or wavy line throughout the designated area without burying them. If you are setting up multiple hoses, position them at least 18 inches from each other so that every plant can get the same amount of water. Use the landscape pins to pin the hoses to the ground prevent them from twisting. Preferably use mulch to cover the hoses completely and help keep the soil moisture longer, but also hide the hoses. Test the system by watering your garden for half an hour. Afterwards, check how far down the water seeps - ideally it should be between 8 to 12 inches down into the soil. Adjust the watering time for optimal results, by setting the water timer to a suitable period of watering required for your plants. This handy thing will save you water in the long run and provide adequate watering without any waste. Finally, make sure that there are no dry spots after your first watering, and adjust the system to cover them if any are found. Osmile Professional Series Soaker Hose - 100 Foot is a round type professional grade soaker hose. As the name suggests, it is 100 feet long, and you can also add additional hoses to prolong it according to your needs. It is made of recycled tire rubber and with double-thick walls and is thus extremely durable, but also somewhat stiff. It is 1-inch in diameter, has one fifth of an inch thick walls and can handle up to 30 PSI of water pressure. It also includes a standard 3/4" garden hose connection. This Osmile Professional hose provides even water distribution and is flexible enough to be curved when it needs to conform to the shape of your beds. It can be positioned both above and below ground, but not deeper than six inches. When used above ground, it is recommended to cover it with mulch. The quality of the hose is backed up by the lifetime limited warranty. The only complaint we have is that during setup the hose needs to be stretched out into the sun for a few hours, or it will be too stiff and difficult to handle. This hose will reduce your water waste and save time you spend watering the garden drastically, but it is a bit expensive. ​The Malnor Soaker hose is a flat type hose made of PVC, ABS plastic, and polyester. 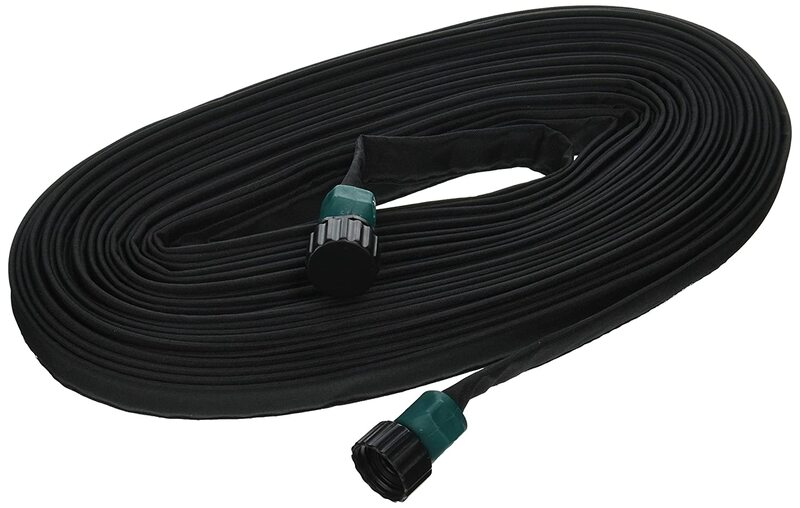 It comes in three different lengths of 25, 50 and 75 feet and you can also connect the number of hoses together and create any length you need to cover the entire area you plan to water. 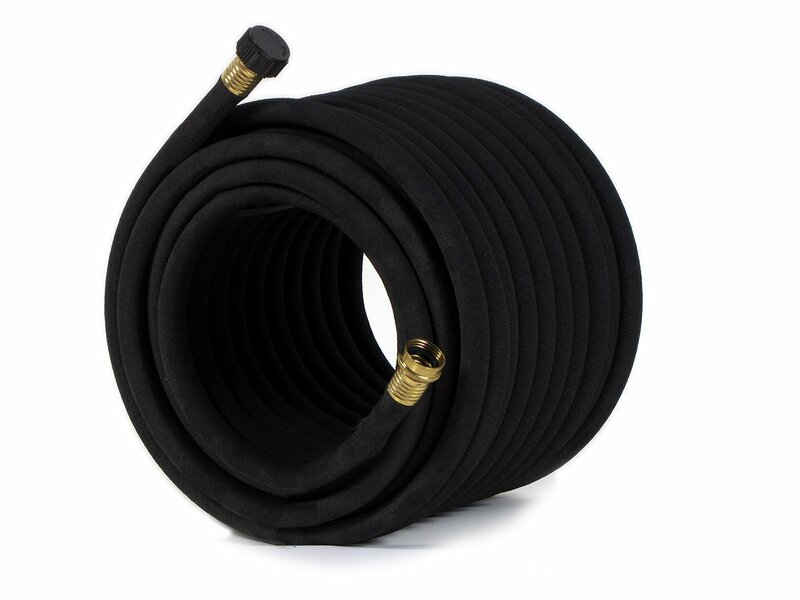 This hose features a standard garden hose connection of ¾, and its interior diameter is 5/8". The recommended water pressure for optimal performance is 10 - 25 PSI and a plastic insert inside the connection reduces water flow effectively reducing pressure when needed. The Melnor hose has no individual holes to clog or enlarge and thus the watering is even and uniform and does not change over time. Namely, the mesh like fabric this hose is made of allows water to seep over the entire length and prevents uneven watering. Unlike some other we have tested before, this soaker hose is not stiff at all and thus remains in place. It can be covered with up to 4 inches of mulch. On the downside, it is not flexible enough and has to be kept curved around a turn or the water stops. Because of the flat design, it may be problematic to position it along edges and curves and may even require some pressure adjusting for it to work properly. 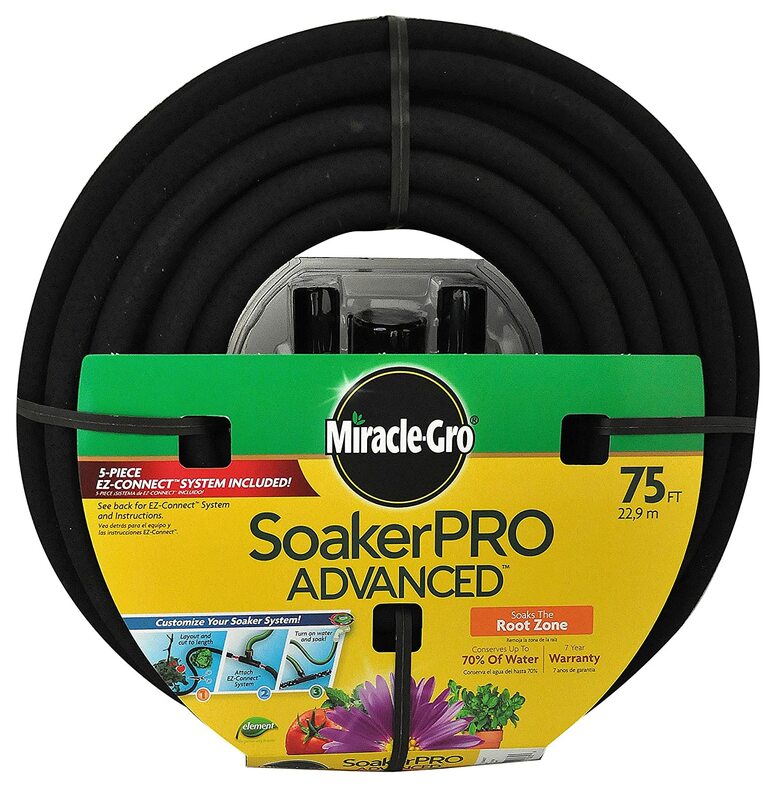 Miracle Gro MGSPA38075CC is a 75 feet long, round type soaker hose. It comes with a pack of EZ connectors which allow for the complete customization. Namely, the hose is designed to be separated and formed into any shape using these EZ connectors to work around curves and edges. The length can be adjusted in the same way to successfully water your entire garden or property. It features 3/8-Inch connect fittings that are not standard, which might sometimes be an issue. The hose is also a bit stiff and should stay in sunlight for a couple of hours before setup so that it straightens properly. This Miracle Gro Soaker Hose is made from durable, 65% recycled material and preserves up to 70% of water which makes it environment-friendly. The hose comes with a pressure regulator which stabilizes the inside pressure and ensures that the appropriate amount of water is released. This soaking hose utilizes the weeping method allowing for small bursts of water rather than the continuous flow and is thus more suitable for the smaller plants. There are no holes; instead, the entire hose seeps water, but unfortunately not completely evenly as we have noticed that no water is coming out from the last few feet. 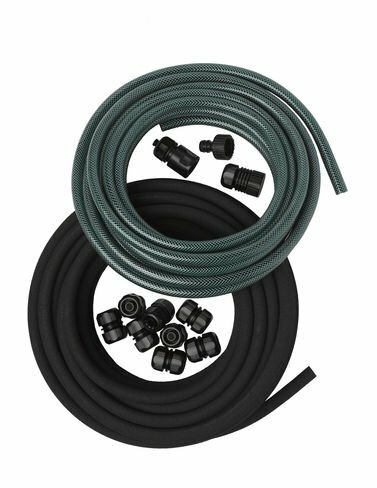 Gardener's Supply Snip-n-Drip Soaker Hose System features two round type hoses, a 50 feet long and a 25 feet long 1/2 Inch hose. It can be used for both raised beds and in ground gardens. It comes with everything you need including a faucet adapter, eight hose couplers, a quick-connect coupler and one end cap. Several beds can be connected to one system as long as you do not exceed 100 feet. The system installs easily - once again though we recommend warming up and loosening the hoses to ease the setup. There are two faults we have noticed as soon as we have started testing the system. First, there is no pressure regulator, and that means that you should control the pressure to avoid leakage and ruptures by reducing the water flow and keeping the pressure under 10 PSI, but it is not easy as it sounds. Next, the hose leaks more water at the beginning near the water outline than at the end. Another minor issue is that it is not compatible with standard fittings from other manufacturers. It is an average priced system that includes everything you need for initial setup- but is hard to customize or repair as it does not feature standard connectors. The soaker hoses are made from recycled rubber, and the fittings are plastic. Gilmour 270075G Weeper/Soaker Hose is another flat type, 75 feet long hose which comes with a seven-year long guarantee and lifetime replacement policy to vouch for its quality and durability. Its flat design allows for it to be used in tight spaces, but also pack and store easily. The hose is made of 100% recycled vinyl which makes it environmentally-friendly. It is covered with fabric that resists clogging and secures consistent soaking but also protects the hose from harmful ultraviolet rays and prolongs its lifespan. This soaker hose utilizes the weeping method which is an ideal solution for growing seedlings and small plants as they need little water. It is very light and easy to move around, and will not damage the plants around it. Moreover, it can be used both above in between plants and flowers, and underground or covered with mulch. This hose does not kink easily and allows for bending without it influencing the water distribution. On the downside, the manufacturer does not provide a pressure rating. Fortunately, there is a "restrictor" in the mouth of the hose that regulates the pressure to an acceptable level. Brass fittings instead of the plastic ones would also be a great addition. After testing all the reviewed soaking hoses, we can honestly recommend any of them as they all have some quality features and perform well when it comes to successful watering. However, #1 Osmile Professional Series Soaker Hose is, as its name suggests, a professional grade product of a higher class. This best soaker hose is sure to last the longest, and if or when it does fail you- you have a lifetime warranty to rely on. No matter which soaking hose you choose, it will surely be beneficial and save you effort, money and time, so do not hesitate for a moment- make your decision and treat yourself and your garden with the best soaking hose on the market. I had a really bad experience with the Gardeners Supply Snip-N-Drip System: so bad, I will never buy from them again. I used to like their products. I was hoping for recommendations for a better quality product, which is why I was searching the web. Would definitely *not* give them a 95, so now I don’t know what to make of your other recommendations. I have soaker hoses which are over 20 years old and still functioning. The Gardeners Supply product split and leaked, and actually broke in several places in the first season. It was not abused in any way. It was extremely brittle. The connections kept falling apart and I had to keep reconnecting them. I have been using soaker hoses for decades with great success, until I decided to buy the Gardener Supply product recently. I also damaged some old hoses digging, and was searching for a comparable product. Who is making a *quality* product in a soaker hose? In other words, one that lasts more than a month or two. I’m not the only person dissatisfied with the current quality, and looking for an answer to this question.